Start your journey toward more peaceful and healthy sleep. 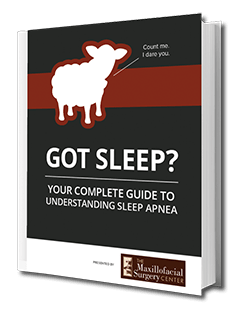 What you need to know about sleep apnea all in one convenient place. You have questions. We have answers! People who snore are often the mark for bad jokes, or even elbow blows in the middle of the night. But loud, disruptive snoring might not be a laughing matter. Snoring of this degree can cause several problems, from relationship troubles and sleep interruption, to life-threatening breathing cessation. In these cases what may have been thought of as a social disturbance may be a potentially life-threatening condition called sleep apnea — our Gilbert and Phoenix area oral surgeon can help! Obstructive sleep apnea (OSA) is a fairly common problem affecting approximately one-in-five adults. During sleep, the airway is obstructed by problems in the airway muscles, nasal passages, or jaw position. Excess tissue, including large tonsils or a large tongue may also contribute to OSA. If you experience symptoms of obstructive sleep apnea, visiting a specialist like Dr. Wilson for a comprehensive exam and an accurate diagnosis can be a matter of life and death. If a sleeping disorder is suspected, you may be prescribed an easy at-home “sleep study,” which will monitor your nighttime sleep patterns. Following the review of the “sleep study,” Dr. Wilson will determine the best course of action in your care. Dr. Wilson has the ability to provide a reliable way to relieve the symptoms of sleep apnea and improve your quality of life. Depending on whether your sleep apnea is mild, moderate, or severe, various methods of treatment options are available: oral appliances, C-PAP therapy, palatal procedures, nasal surgeries, or corrective jaw surgery. If you or your loved one is suspected to have sleep apnea, we encourage you to call our office to schedule your comprehensive evaluation today.